Samsung Electronics America, Inc. has announced an expanded roster of audio products, all aimed at elevating the entertainment experience across the home. Building on the 2013 launch of the Samsung Shape Wireless Audio – Multiroom System, Samsung has greatly expanded the ways consumers can enjoy superb sound in every room of the house with its new multi-room offering and integration of wireless and multiroom technology across its 2014 flagship soundbar, Blu-ray player and home entertainment system products. The new product line reflects the growing demand for solutions that offer consumers the ability to manage multiple audio sources. The addition of the entry-level M5 speaker to the Samsung Shape Wireless Audio – Multiroom system. These speakers can be used alone or wirelessly with other Samsung products to create custom audio home systems. Samsung’s stylish and versatile Sound Bar and Sound Stand products offer vivid and consistent sound as well as space efficiency through innovative design and engineering. Under a TV, Samsung’s ultra-slim technology and elegant design maximize surround sound and deep bass performance for rich and clear sound. Samsung’s MX-HS8500 GIGA Sound System, the world’s first component audio system to integrate the main system and speakers, is ready to rock the house. With integrated wheels that maximize mobility, booming sound and synchronized lighting effects, the GIGA turns any setting into the hottest club in town. The Samsung HT-H7730WM Blu-ray Home Entertainment System is an experience not found anywhere else. It’s a one-of-a-kind 7.1 channel system with virtual 9.1 channels that only Samsung can provide, thanks to its exclusive integration of the DTS Neo: Fusion II codec. Carbon Nano Tube speakers combine with Vacuum Tube Digital Amplification to provide sound that’s warm and natural, yet amazingly powerful and clean. The Samsung Shape Wireless Audio – Multiroom system enables music lovers to enjoy tether-free entertainment in any room of the house, from various music sources. The flexible speakers can be used alone or in combination with the Wireless Audio – Multiroom Hub and additional M7 or new M5 speakers to create a multi-room, multi-channel surround sound system. Easy plug-and-play installation makes network set-up a breeze between Samsung AV products: simply connect the Shape or optional Samsung Hub to a router, plug in, and download the free app to effortlessly control multiple speakers and audio sources from a smartphone. The Shape offers visual harmony within any room environment. Its unique design affords a wide variety of placement choices, allowing it to fit snugly in the corner of the wall as if it were custom-designed for the space. It can also be positioned vertically or horizontally for maximum versatility. 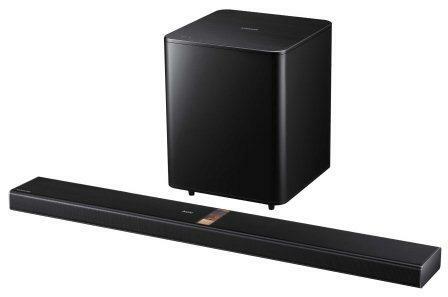 Samsung’s HW-H750 Soundbar amplifies any home entertainment experience with 320W of great sound. Delivering full cinematic and lifelike sound to enhance the home theater experience, the Soundbar combines the warmth and natural sound of analog with the latest digital audio technology to deliver a rich and powerful sound. With its sleek, metallic design, the HW-H750 is destined to look as good as it sounds paired with a large screen TV. The unit also is compatible with Samsung’s growing roster of Shape Wireless Audio-Multiroom products to further expand music options in the home. The HW-H600 Sound Stand is designed to fit under TVs ranging in size from 32 inches up to 55 inches. Its Multi-direction technology provides rich 4.2-channel sound in a sleek, low-profile (1.4”) design. It’s the perfect accompaniment to a bedroom TV, or a main TV in a smaller space, where a complex sound system won’t fit. Both the Soundbar and the Sound Stand make it easy and convenient for consumers to set up a wireless connection with the TV. They also support Samsung’s TV Sound Connect feature, which outputs TV audio through the devices via Bluetooth. This greatly simplifies and streamlines installation of either system at home. With Bluetooth, consumers can connect either device to a variety of mobile devices and experience the same great, lossless sound.